Recently, I attended the 2018 PCMA Convening Leaders conference in Nashville, TN. My company (etouches) was co-hosting an event with American Tradeshow Services (ATS) and ExecutivEvents. We were in charge of the catering and the other two companies were in charge of entertainment. Thankfully, the three companies work extremely well together, and if I do say for myself, we put together one fabulous event. For the entertainment, they brought TheToonHeadz (professional caricatures artists) in and I was mesmerized. The faces behind TheToonHeads are Bobby Morris and A.J. Jensen. Their interest in caricatures was something that came to both of them at a young age. Both gifted with the natural ability to draw, they took their passion on the road to festivals, events and special gatherings to craft their skill. Bobby and A.J. combined talents after bumping into one another while working at an event. 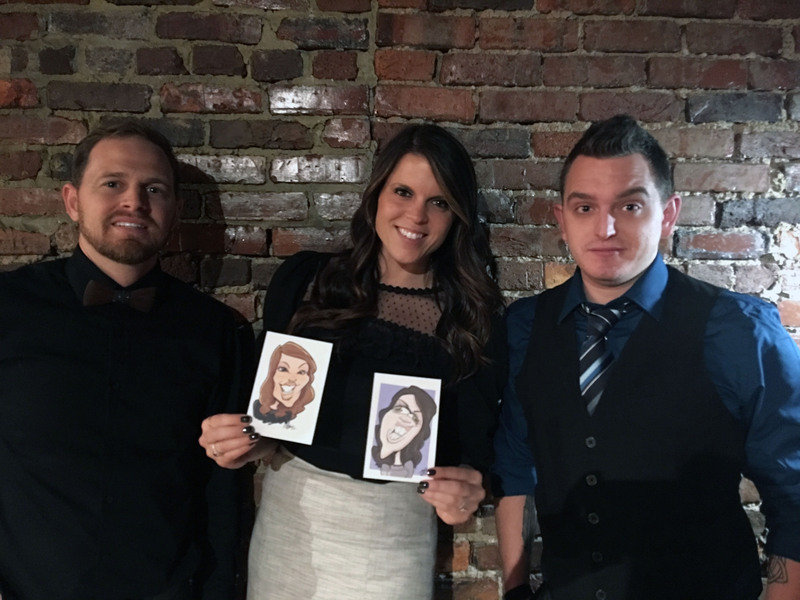 Since then, they have taken their dynamic talent on the road where they continue to share their love and passion for drawing caricatures and creating unique experiences one drawing at a time. For those who do not know what caricatures are, here is the definition: a picture, description, etc., ludicrously exaggerating the peculiarities or defects of persona or things. Back to the event. There were a few attendees that showed up earlier than excepted, and before TheToonHeadz could even complete their setup, lines were already forming. Bobby and A.J. were very inviting and super engaged with our guests, which made the overall experience even more special. After a long day of breakout sessions and speakers, this treat was an escape where everyone could let loose and have a bit of fun. As each person sat in their chair to be drawn, crowds gathered to watch the big screen where TheToonHeadz were projecting their work to increase the curiosity. They definitely brought out the inner child in all of us. As TheToonHeadz completed one caricature after the other, each event attendee wanted their personal caricature to outdo the others. The environment was so much fun to witness. Even as the event came to a close, the lines were still a few people deep. No one wanted it to end. After each person received their unique caricature, it was placed on a bottle of wine as a parting gift. A smile and giggle were guaranteed reactions as they saw their hilarious caricature on a bottle of wine – one that that they could share at a special occasion. As someone who has been in the event industry for over a decade, creativity goes a long way in repeat attendance at conferences and events. Out of the box thinking is critical and adding TheToonHeadz was a fabulous way to accomplish it at the 2018 PCMA Convening Leaders conference. Check out TheToonHeadz today and see how they can bring to life your next event! Here are my two hilarious caricatures by A.J. and Bobby! I love them!